The Emberizidae are a large family of seed-eating passerine birds with distinctively finch-like bills. In North America, most of the species in this family are known as (American) sparrows, but these birds are not closely related to the (Old World) sparrows, in the family Passeridae. The family also includes the North American birds known as juncos and towhees. 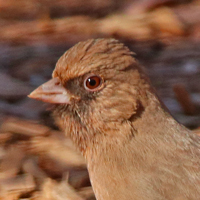 It was hypothesized that the family Emberizidae may have originated in South America and spread first into North America before crossing into eastern Asia and continuing to move west. This would explain the comparative paucity of emberizid species in Europe and Africa compared to the Americas. However, a DNA sequence-based study of passerines concluded emberizids spread from North to South America. As with several other passerine families, the taxonomic treatment of this family's members is currently in a state of flux. Many genera in South and Central America are, in fact, more closely related to several different tanager clades, and at least one tanager genus (Chlorospingus) may belong here in the Emberizidae. This list includes 32 species of emberizid found in Utah.